As another analyst points out, however, ascertaining the role of risk aversion in the markets has become somewhat circular: “Observers…draw this assessment purely from price action. Rising equities means the market is less risk averse. 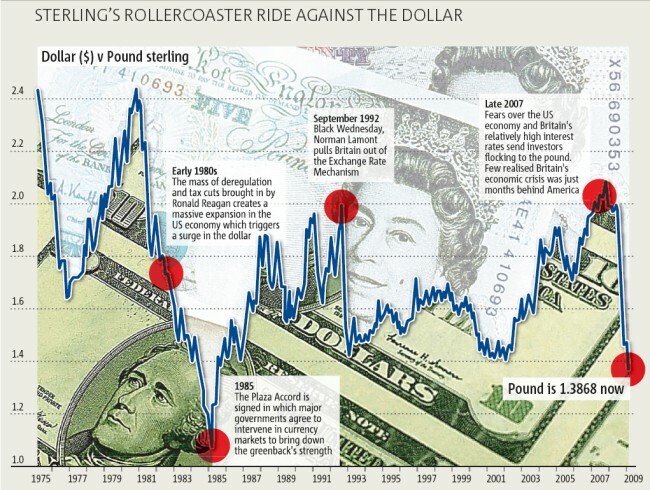 And the way we know there is less risk adversity is that the stocks have rallied.” Applying this argument to forex, softening risk aversion is contributing to a stronger Pound. At the same time, observers point to the rising Pound as a signal that risk aversion has softened. In short, the safe-haven trade is surely not the most convincing explanation. Given all the bad news, perhaps the Pound’s recent rise can be best attributed to technical factors. “The $1.45 level represents so-called resistance on a descending trend line connecting the January high of $1.5373 and the February peak of $1.4986.” Given that the Pound has since sunk back below $1.45, it can be reasonably discerned that a cluster of sell orders were executed at this level.